Whether you’re comping a vocal track, restoring an old recording, working with dialogue or sound effects for film, or imposing your own vision with mash-ups or remixes, audio editing is a key skill to successful sound production. Digital Audio Editing gives you the techniques, from the simplest corrective editing like cutting, copying, and pasting to more complex creative editing, such as beat mapping and time-stretching. You’ll be able to avoid unnatural-sounding pitch correction and understand the potential pitfalls you face when restoring classic tracks. 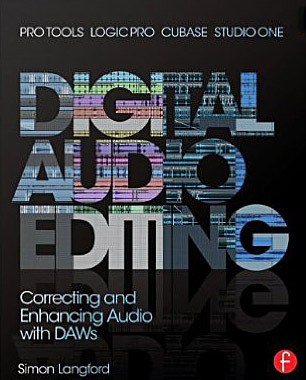 Author Simon Langford invites you to see editing with his wide-angle view, putting this skill into a broad context that will inform your choices even as you more skillfully manipulate sound. Focusing on techniques applicable to any digital audio workstation, it includes break-outs giving specific keystrokes and instruction in several popular DAWs, including Studio One. The companion websites include tutorials in all four software packages to help you immediately apply the broad skills from the book.